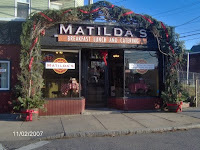 My brother, Wesley, bought a restaurant in Boston several years ago -- Matilda's Sandwich Shoppe. It's a tiny place on Crawford Street in the industrial suburb of Watertown, nearly unnoticeable when driving by and only open until 2:00 weekdays for lunch and breakfast, but it is beloved by patrons, who stand in lines out the door for large meaty sandwiches made on fresh-baked bread. It was a Place when Wesley bought it and it's even more of a Place now because my brother has put his own unique stamp on it. He's added his own family pictures and bits of memorabilia to the small seating area, and knows all his customers' names and greets them with jokes and smiles, which seems to please them immensely. He's named the large sandwiches after rather stout women we knew as children -- the Clarabelle Norris, for instance, and one of his best-selling sandwiches is named after our grandmother, the Cleona Pearl. When our friends, Jo and Tom, went to Boston recently, they unexpectedly stopped by to see my brother's restaurant. He did not know they were coming and had never met them before, but he treated them to fat Reuben sandwiches and sat talking with them for over an hour. They said they've never felt so much at home, and thought the stop by the sandwich shoppe was one of the best parts of their trip. Many others feel the same way, because while other restaurants in the area are struggling to remain afloat in the tough economy, Matilda's continues to attract lines out the door. Wesley attributes it to his homemade, quality, reasonably-priced food, and I'm certain that's a big part of it. But I think people are attracted to Place, like moths to a flame, and my brother seems to intuitively know how to create it.